Still reeling from a devastating betrayal, and a shaky relationship with Ethan, her Guardian Angel, Samantha reluctantly seeks comfort with Damien - the original fallen, the devil whispered about and part of the original deception of Adam and Eve. She learns of the real reason for his existence – a sad and twisted reason that would force even the most ardent Bible thumpers to show sympathy. He agrees to help Samantha fight Sebastian but what she doesn't know is there is a price for Damien's involvement. A price she would never allow. The only problem is, she isn't the one making the sale. Tricia: Can you tell us a little about yourself? Christine: I’m a former middle school English teacher, a mom of two fabulous little men and the wife of an amazing husband. I drink way too much coffee, spend more time than I’d like on marketing though I do enjoy meeting all the new people promotion brings, dislike discussing religion and politics, love the NY Jets even though they disappoint me every year and feel like I’m the slowest writer on the face of the planet. Christine: I seriously began writing about 3 years ago though I’ve always written something – in HS and college, it was poetry and short stories. 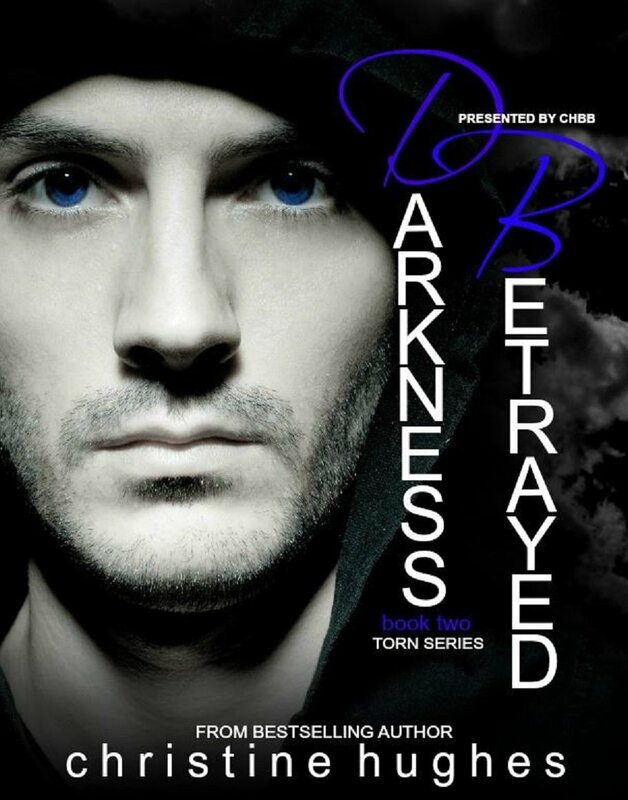 Christine: Darkness Betrayed is the follow-up to TORN. In this one, Samantha comes to grips with the betrayal of the first novel, makes mistakes based on what others have deemed “law” and ends up pushing away the one person who’s stood by her side. Additionally, we meet Damien, the devil. Samantha is instantly drawn to him but doesn’t realize until it’s too late that working with the devil always has a catch. Christine: The idea for Darkness Betrayed came from TORN – I needed some growth and I needed some more alignment. I needed a catalyst that would finally push Samantha to one side or the other. Damien is that catalyst. Tricia: If you could recommend just one of your books to my readers, which book would you choose? Christine: Oh goodness, I don’t know. If you love paranormal YA, then I would start with TORN. If you like to cry and have stock in Kleenex, I’d go for Three Days of Rain. Two very, very different genres, two stories that end up on opposite ends of the reading spectrum. Christine: It used to be Sebastian from TORN but Damien was so much more fun. He can actually get close to Samantha, he clouds her mind, he twists her thoughts, he, I think, really loves her. Christine: The middle. I always know how it begins – the first 25,000 words come easily and the end is always in the back of my mind. It’s the middle that screws me up a bit. Tricia: What is your primary goal as an author? Christine: I want to write good stories that people will read and recommend to friends. I’ve tapped into this need to get it out, to tell a story. I let it all come organically. Whatever topic or idea presents itself with the best case, that’s the one I’ll tell next. I have a list of ideas. Christine: I am currently working on an untitled thriller of sorts. One of my favorite books when I was in middle school was Lois Duncan’s I Know What You Did Last Summer (the movie did it no justice) and I love Agatha Christie’s And Then There Were None. I kind of mashed the two, keeping it YA, and added a bit of comedy (think Clue). I ham having a lot of fun writing it but it’s tedious – I have to make the killer a plausible suspect. Christine: A few years back, Cyn Balog (author of Sleepless, Touched, Fairytale…) told me to write and when I did and finished TORN, she told me I stopped being an “I want to” and became an “I did.” I like to pass that on – stop wanting to and do it. You want to write? Then write. Keep writing. Even a few hundred words a day is more than you had the day before. And get a good editor – something I did not do when I wrote TORN and when I queried, I had so much interest it wasn’t ready. As she stood, her chair flew back and shattered against the wall and she lifted me from the floor, her hands outstretched in front of me. His voice was like silk, but his eyes burned a hole through her. She cowered and stepped back until she was flush with the wall behind her. Malakai gasped and dropped to his knees, head bowed. “Yes sir,” she replied without lifting her face. Rubbing my throat, I turned my attention back to the open door. I gasped, knowing who stood there, contemplating me with amusement in his eyes. I’d expected him to look like the Exiled minions, for some reason. I thought, for sure, that he would either be some red demon with pointy horns and a long tail or oddly bent and grotesque like Malakai. But, heaven help me, as he stood before me, a knot rose in my belly. The very same knot I’d feel in Ethan’s presence. A strange longing invaded me and I couldn’t tear my eyes from him. Raven hair fell slightly above his eyes, his strength was visible through his black t-shirt and his jeans were just tight enough to make me feel uncomfortably warm. My face flushed under his gaze then he flashed a smile and I couldn’t stop staring at his perfect white teeth. Holy crap. Or was it unholy crap? Surely he couldn’t be who I thought he was. He walked over to me with the angelic grace I’d come to expect. By the time I blinked, he was standing before me, fingertips grazing my throat, easing the constricted feeling. “Samantha.” He whispered my name so only I could hear it. My palms began to sweat and my mouth dried. I tried to prop myself up against the wall when my knees threatened to release me. I tried to look anywhere other than directly at him, but I couldn’t stop staring, mouth gaped open with inexperienced embarrassment flooding through me.